I think at this point, we have made our opinions clear on Qualcomm’s Quick Charge 2.0 – we love it. We think every phone should have either this or some other form of quick charging. Wireless charging is still a really handy feature, but I would much rather be able to charge my phone in a shorter amount of time, or at least give it a burst of juice in a couple of minutes, than be able to lay it down on a charging pad that likely charges slower than a conventional charger. To demonstrate the power of Quick Charge 2.0, Qualcomm put together the video featured below, which includes three Nexus 6 phones, all of which are using a different charger. Two of the phones are using conventional chargers (5 volts/1 amp and 5 volts/2 amps), while one uses Motorola’s Turbo Charger. You probably don’t need to watch the video to know who wins the battle to 50% from 0%. Now, we should point out that Samsung’s Galaxy S6 and S6 Edge also include a form of fast charging, but it’s not Qualcomm’s Quick Charge 2.0, at least as far as we know. Samsung skipped Qualcomm silicon in these devices, instead opting for their own in-house Exynos line. But, their own form of fast charging seems like its just at 2A speeds, which Quick Charge 2.0-equipped chargers produce as well. There is a chance that the Quick Charge 2.0 chargers you have been hoarding over the last few months will work with a Galaxy S6, should you pick one up. Either way, we are still firmly under the belief that quick/fast charging is the future. That is, until someone creates fast wireless charging. 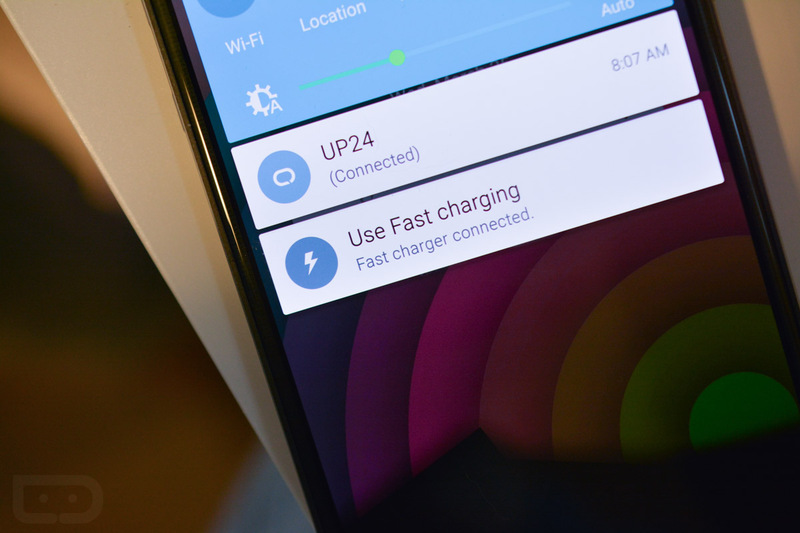 To read more about Quick Charge 2.0, be sure to check out this post of ours.